The Grinch:"Ha ha ha ha! Cheer up dude, it's Christmas." The Grinch:"Tomorrow is Christmas. It's practically here. Max! Fetch me my sedative!" The Grinch:"Aren't you going to cuff me? Put me in a choke hold? Blind me with pepper spray?" The Grinch:"How dare you enter the Grinch's lair! The impudence! The audacity! The unmitigated gall! You've called down the thunder, now, get ready for the boom! Gaze into the face of fear. Booga booga!" The Grinch:"Ha ha ha ha. That's a good one. That is rich." The Grinch:"I'm the Grinch that stole Christmas, and I'm sorry." The Grinch:"Kids today. So desensitized by movies and television." The Grinch:"It's not a dress, it's a kilt! Sicko!" The Grinch:"Almost lost my cool there." The Grinch:"Merry Christmas one and all!" The Grinch:"Odd. Better check the outgoing." Grinch Recording:"If you utter so much as one syllable, I'll hunt you down and gut you like a fish! If you'd like to fax me, press the star key." The Grinch:"Oh the wailing and gnashing of teeth! The bellowing of the bitterly bummed out! It will be like music to my ears!" The Grinch:"Well that worked out nicely." Narrator:"And he puzzled and puzzled, until his puzzler was sore." The Grinch:"Oh no. I'm speaking in rhyme! Ahhhh!" The Grinch:"Nerve of those Whos. Inviting me down there, on such short notice. Even if I wanted to go, my schedule wouldn't allow it! 4:00, wallow in self-pity. 4:30, stare into the abyss. 5:00, solve world hunger. Tell no one! 5:30, Jazzercise. 6:30, dinner with me. I can't cancel that again! 7:00, wrestle with my self-loathing. I'm booked! Of course, if I bump the loathing to 9:00, I could still be done in time to lay in bed, stare at the ceiling and slip slowly into madness. But what would I wear?!" The Grinch:"What is that stench? It's fantastic!" The Grinch:"You see! Even now the terror is welling up inside you!" Cindy Lou Who:"Um, maybe you need a timeout." 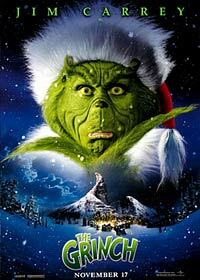 The Grinch:"One man's toxic sludge is another man's potpourri." The Grinch:"I don't know. It's some kind of soup." The Grinch:"Oh bleeding hearts of the world unite!"